MARERIALS:Polyester material with high mechanical strength, high tensile strength, low coefficient of friction and light weight,which is durable and strong . VERSATILE AND EASY TO USE HARNESS :Safe seat belts perfecting for mountaineering and rock climbing,outward band,fire rescue,working on the higher level,caving，Rock Climbing，Rappelling.Waistbelt equipped with one buckle which easily adjust and center the harness. 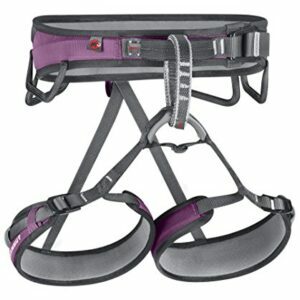 HUMANIZATION DESIGN :Traditional buckle, harness construction distributes pressure to keep you comfortable while climbing;waist belt and leg loop are lineed with breathable mesh to ensure comfort in warm temperatures. 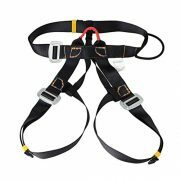 .Perfecting for mountaineering and rock climbing,outward band fire rescue,working on the higher level,caving,falling protection etc. DEMENSION :Waist loops size 50-124cm/21.7-48.8inch,Leg loops size：40-75cm/15.7-29.5inch.Product Weight:580g/1.28lb. STRUCTURE: Single Dyneema-reinforced tie-in point for increased durability. 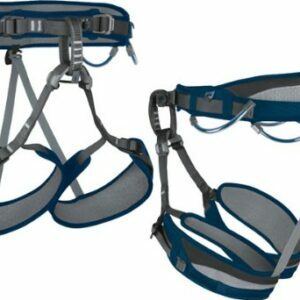 Two flexible equipment loops stay out of the way while wearing a pack. Detachable leg loop elastics. 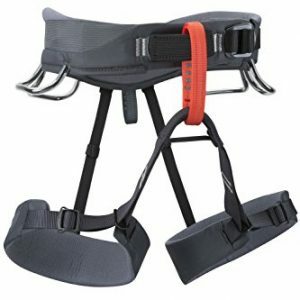 Leg loops and waistbelt are color coded to facilitate donning.